An application schema defines semantics of content and the logical structures of geographic data. The schema thereby supports the information requirements of one or more use cases. The more use cases the schema supports, the higher the complexity of fully implementing it typically is. A specific application often only needs to support a specific subset of these use cases. Therefore, a typical goal is to restrict the full application schema to just the information that is required by the application, thereby reducing the implementation cost and complexity. Such a restriction is what we call a “schema profile” (also just “profile”, or “profile schema”). The process of creating a schema profile is called profiling. Subsetting the full application schema, i.e. removing schema elements that do not belong to the profile. The resulting profile is a new application schema, typically in a profile specific namespace. You can derive an implementation schema from this profile, for example a database schema or an XML Schema. NOTE: An XML Schema of the schema profile would contain a subset of the elements that are contained in the XML Schema of the full application schema, and be in a different namespace. The restrictions defined by the schema profile are fully represented by its XML Schema, and can be checked by validating XML encoded data against this XML Schema. Use this approach if you can – and are allowed to – directly modify the full application schema, and if you can – and are allowed to – ignore the implementation schemas that have been derived from the full application schema. Creating an additional application schema that defines the restrictions of the full application schema via OCL constraints. These constraints would be modelled on classes that belong to the additional schema, which then defines a schema profile. This schema profile also typically belongs to a unique namespace, and you can derive implementation schemas from it. NOTE: The derivation of implementation schemas has a different goal when compared to the other way of profiling. Here, a database schema or XML Schema of the profile would not represent the restrictions. In fact, the XML Schema of the profile would import the XML Schema of the full application schema as-is, and could define extensions. However: A Schematron Schema derived from the OCL constraints in the profile schema would provide the means to validate XML encoded data, and ensure that the restrictions defined by the profile are met. NOTE: This way of creating a profile is compliant to creating metadata profiles as defined by ISO 19115/19139. The ProfileConstraintTransformer has transformation rules that support this way of profiling. Use this approach if you are not allowed to directly modifiy the full application schema, and if you are not allowed to ignore the implementation schemas derived from the full application schema. You can enforce the restrictions defined by the profile through specific implementation schemas derived from the profile – like a Schematron Schema. The following sections provide a brief overview of the transformations that support different aspects of profiling. Each section also contains a reference to the detailed documentation of the respective transformation. 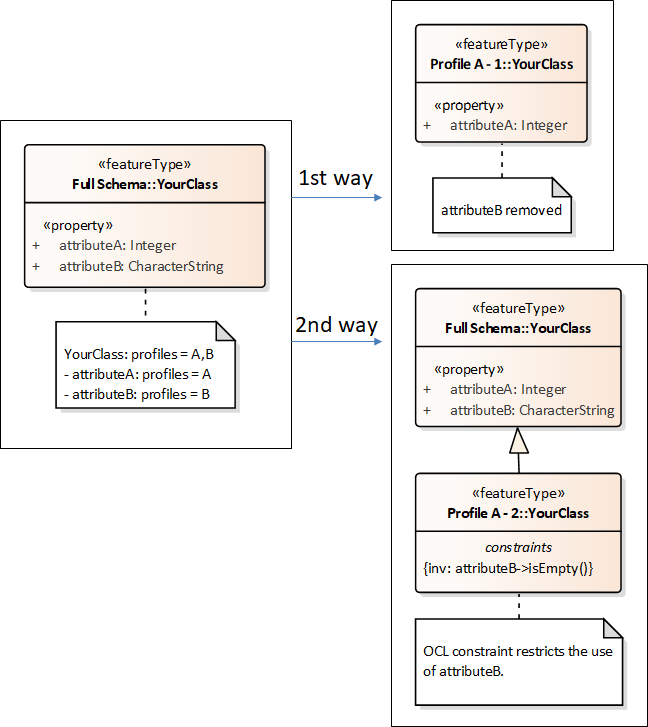 Whether or not a class or property belongs to a particular profile is typically modelled via the tagged value “profiles”. You can set this tagged value in your model, and ShapeChange would read the profile information when loading the model. However, modelling a profile this way can become quite complex. 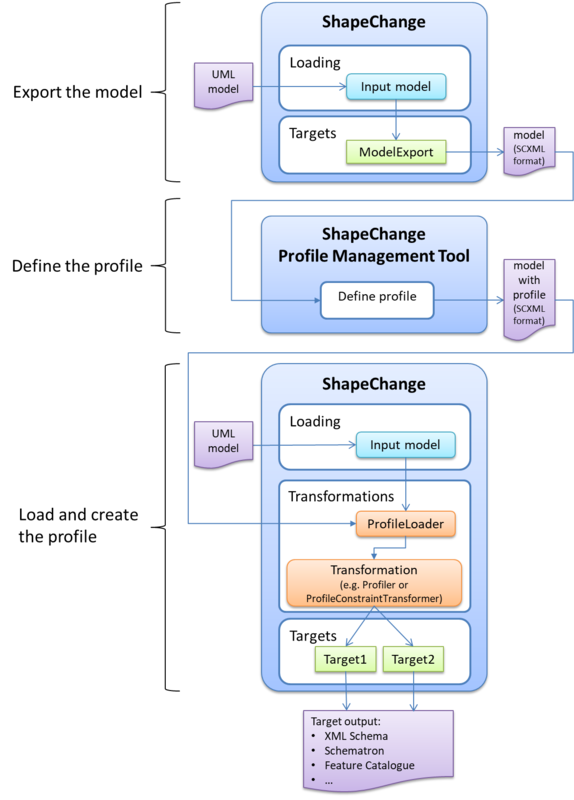 The ShapeChange Profile Management Tool (PMT) was developed to support a user in defining profiles. Profiles defined with the PMT can be loaded into the model using the ProfileLoader transformation (for further details, see here), and then be used by subsequent transformation. The following picture illustrates this workflow. The detailed documentation of the ProfileLoader can be found here. The Profiler transformation uses profile information in the schemas selected for processing to create a subset, i.e., a “profile”, of these schemas. The detailed documentation of the Profiler can be found here. NOTE: Schemas are selected for processing via specific parameters, either on the configuration of the transformation or the input (for further details, see here). This transformer creates restrictions of the model elements in specific application schemas by creating OCL constraints in subtypes of the corresponding classes (of the application schema) in a separate profile schema. The constraints encode the restrictions. They can be used, for example, to derive a Schematron Schema. The detailed documentation of the ProfileConstraintTransformer can be found here.